Today’s post is another in our series on the lessons to be learned from guru investors, via the book Excess Returns. It’s about Company Valuation. It’s been almost a year since we looked at Excess Returns, the book which compares the methods of the world’s greatest investors. Today’s article will take us past the halfway point in the book. In my business school I would only have two courses: (i) how to value a business; (ii) how to think about the stock market and deal with volatility. – Warren Buffett. Working out the intrinsic value of a stock is challenging, and more of an art than an exact science. It relies on estimates, projections, and qualitative assessments as much as numbers. The discounted cash flow (DCF) model is the most mathematically rigorous approach, though that does not make it the best, or the most useful. You then add the current cash per share (c) to arrive at the current intrinsic value (IV) of the stock. But even making estimates for stable businesses is difficult, and the formula used to calculate IV heavily weights the cash flows from the period beyond five years into the future. Price to Earnings (PE), or its inverse, the Earnings Yield, is the most popular valuation ratio (multiple). Earnings needs to be normalised to remove extra-ordinary and non-recurring – and indeed, unsustainable – items, to produce recurring earnings. Convertible bond, share options and warrants that are likely to be converted in the future need to be added into the number of shares outstanding (this produces what is known as the fully diluted PE). The PE needs to be compared to that of a company’s main competitors, its sector, and the market as a whole. Over the long run, stocks with low PE will outperform, particularly those with low trailing PE (which does not depend on projections). PE is not suitable for companies with negative earnings, for those suspected of dubious accounting, or for cyclicals (whose returns are driven by the business cycle). The Shiller CAPE (used to value indices) uses 10 years of earnings. Templeton also used to look at the projected earnings five years out, and to buy stocks where the current price was less than five times these earnings. Companies with higher expected growth with normally trade at higher PEs. And those with erratic performance, operations in risky developing countries and / or lots of leverage tend to trade at lower PEs. Many investors use the PEG ratio (trailing PE divided by expected 5-year annual growth rate) to account for growth rates. Companies with a PEG less than 1 are seen as cheap and have been shown to outperform the market. This ratio divides the stock price by the operating cash flow (OCF) or the free cash flow (FCF). The capital expenditure earmarked for growth (capex-growth) needs to be added back to the FCF to produce the FCF-maintenance figure. Otherwise the ratio would punish growth companies that reinvest cash to fuel expansion. For very fast-growing companies, twice the FCF-maintenance figure for the last six months can be used (this is sometimes called the owner earnings run rate). As with PE, the figure can be calculated on the shares in issue, or fully diluted. P/FCF is more useful for mature companies, since capex-growth is often hard to estimate for growth companies. P/FCF is particularly useful for companies with large non-cash expenses and for cyclicals. P/S is normally used for companies with no or negative earnings, or where current earnings are depressed temporarily (turnarounds, special situations). But in fact it’s suitable for most mature companies, being more stable than PE and P/FCF. It’s unaffected by profit margins or capex, and less sensitive to earnings manipulation. A drawback is that the amount of debt is ignored. Lower leverage (lower risk) should mean higher P/S, but often doesn’t. Some analysts prefer the EV/S instead of the P/S (see below). P/S is particularly dangerous when used with “blue sky” companies that haven’t yet made a profit yet. These companies can run out of cash before this happens. Investors like Joel Greenblatt use ratios that include EV because the inclusion of debt makes the number more conservative. Greenblatt used EV/EBIT as his “magic formula”. It can be shown that the “fair” EV/EBIT increases with growth where the return on capital is higher than the cost of capital. EV-EBIT can be divided by the growth rate to produce a “PEG-EV/EBIT”. The EV/EBITDA excludes depreciation and amortisation. This puts companies with different depreciation / amortisation methods on the same playing field. Which is probably wrong, since companies with higher depreciation and amortisation deserve a lower EV/EBITDA multiple. EV/FCF tells you how many years of the company’s current cash flow are needed to pay for the entire company. This can be divided by the growth rate to produce a “PEG-EV/FCF”. EV/S is an improvement on P/S as it takes into account the capital structure of the company. Goodwill may be subtracted from book value to produce tangible book value. The first thing to note is that fair value for a stock is not its book value. So fair P/BV increases with the growth rate. A higher cost of equity, COE – because the firm becomes higher risk and equity investors require a higher return – decreases fair P/BV. So companies with high ROE and low risk deserve a P/BV in excess of 1. Companies with inferior returns and/or high risk may be overvalued at P/BV = 1. Ben Graham was a fan of low P/BV stocks, which tend to outperform, especially during difficult markets. P/BV is most useful for asset-heavy businesses (banks, insurance and real estate companies, and those with investment holdings). Their (tangible) assets are highly liquid and can easily be converted into cash. Also for capital-heavy industries – regular inflows of new assets mean that most assets will be close to current market prices. Liquidation value (LV) is only relevant for companies that are in decline and / or likely to go out of business. Ben Graham used a very conservative definition of liquidation value, which he called Net Current Asset Value (NCAV). NCAV assigns no value to intangibles and fixed assets, as Graham argued that in a liquidation the value of these assets would be low. This offsets the risk that it may be hard to sell certain inventories, and that certain receivables may remain uncollected. Graham looked for firms where the market cap was less than 70% of NCAV. To avoid value traps (companies that are cheap for a reason) he also required a satisfactory earnings record and decent earnings prospects. Liquidation value can seriously underestimate the true worth of a going concern. The replacement value (RV) is the cost a competitor would incur to build a clone of the company from scratch. It is only suitable for stable businesses. It is not suitable for high growth companies or those with unique competitive advantages (that are hard to replicate). RV can be hard to work out for those not familiar with the company’s industry. Investors should stay within their circle of competence. Liabilities include off-balance sheet commitments that must be settled prior to a distribution to shareholders (eg. operating leases, claims) and increases to reserves that are not presently conservative enough. In general, these calculations are too complex for most private investors. 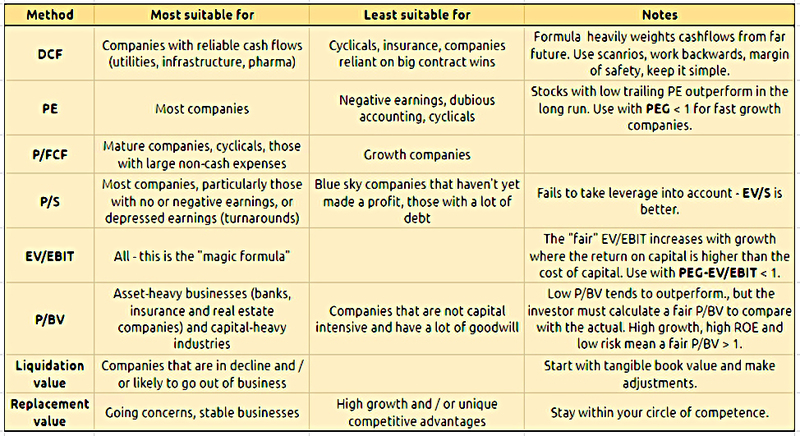 For companies with few competitive advantages, the fair value is the Net Asset Value (NAV). This is the LV (for businesses in decline) or the RV (for going concerns). The excess over NAV is called the franchise value (EPV – NAV). Companies that can grow their franchise significantly are given an even higher value, the Full Growth Value. This adds a growth premium to EPV. The main requirement for a company with a franchise (competitive advantage) is that they can maintain a constant stream of earnings and cash flows “in perpetuity”. To calculate an EPV, we need to estimate the “sustainable and distributable income” and discount it to the present using a discount rate (R). R is related to the risk of the firm and the return on competing investments (eg. risk-free bonds). The average R for US stocks would be the market return, 9%. A highly-rated company might use 125% of the 10-year Treasury yield. Adjusted earnings assumes that all of the company’s capital is equity (no debt, no interest is paid) and it has no cash (no interest is received). To get to EPV the company’s debt must be subtracted and the “excess” cash (eg. above 1% of sales) added back. It can be shown that EPV is higher than NAV (a franchise value will exist) if the company earns a return on its operating assets in excess of its cost of capital. This can be seen as excess returns due to sustainable competitive advantage. Graham-and-Dodd investors are sceptical of above-average growth projections because they seldom materialise. Even for franchises with significant growth, they will not pay full price for growth. “Value on a deal basis” attempts to determine what an acquirer would pay for a business. Investors who use this tool keep files on previous mergers and acquisitions to calculate likely multiples in future deals. The relevant multiple (ratio) will vary by industry and sector. P/S has been identified as most relevant in auto parts. Price-to-subscriber and price-to-cashflow work for cable TV companies. For complicated businesses, a “sum of the parts” approach (see below) can be taken by calculating the deal value of each business segment in turn. Acquisitors usually overpay – particularly during booms, and some discount will need to be applied to the deal value. The true “sum-of-the-parts” approach calculates the value of each business division using the most relevant valuation tool. It works best for diversified conglomerates and holding companies. Top investors accept that valuation is difficult and they will make mistakes. Avoid DCF methodology because of the inherent uncertainty about the parameters. avoid valuing risky firms (eg. very leveraged). Focus on relatively stable businesses. 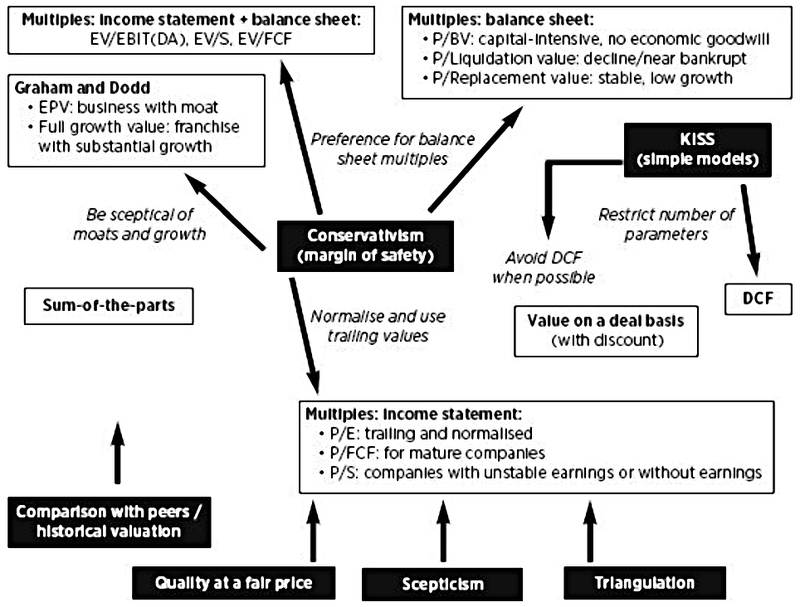 Use the most relevant valuation method for each business. Use simple ratios that depend on only three to five inputs. Don’t use a single metric. Real bargains stand out on all (or most) of your chosen measures. Compare the valuation of a company to that of its competitors and explain the discrepancies. Compare to historical values over 10 years and at least one business cycle. This is most useful with cyclicals and mature companies. Although over-paying for quality is a common mistake (excellent businesses are usually recognised by the market), an equally harmful mistake is to buy a so-so business at a cheap price. Buying good businesses at fair prices is better than buying fair businesses at good prices (Buffett, Templeton). The best performing stocks of the last 50 years in the US had PE ratios of 20 to 50 before they made their big advance. The market exaggerates the risks and uncertainties of good businesses and underestimates the risks and uncertainties of so-so businesses. This is reflected in earnings beats and fails, and the subsequent share price reactions. Since a lot of smart people work in the stock market, when a stock looks cheap there is usually a reason. Double-check your investment thesis when you discover a “bargain”. Check accounting methods, especially for foreign stocks. Even if a stock is genuinely undervalued, you may not make a quick profit. Stocks can stay undervalued for a long time. Undervalued stocks can be taken private or acquired at a bargain price. Remain within your circle of competence, where your chances of success are higher. And one day I’ll get around to looking at the Graham and Dodds method in more detail. Next up in Frederik’s book is Process. We’ll be back with a look at that in a few weeks.